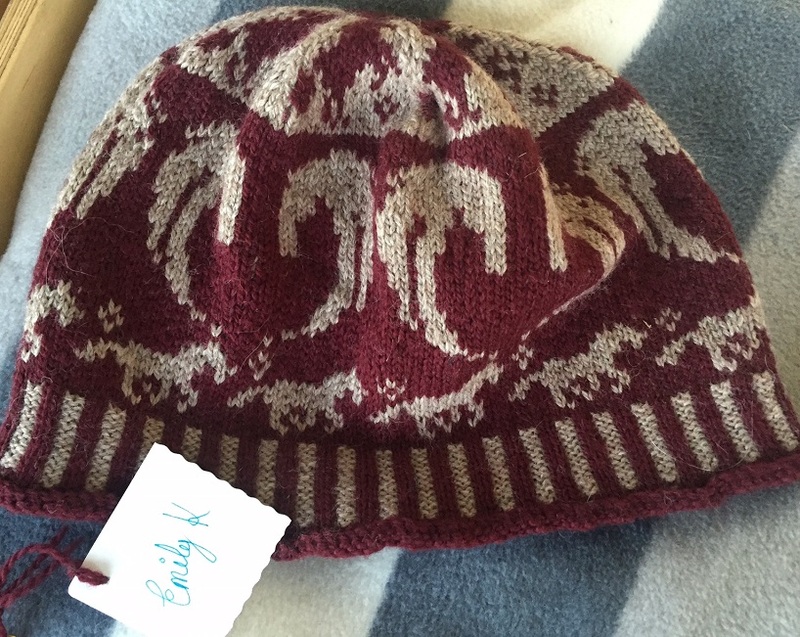 The mother of our one Junior found herself with plenty of time on her hands recovering after a surgery so she hand knitted a whole bunch a beautiful hats with our Landmark Equestrian logo! What a lovely treat to find in my trunk- super impressed by her skills! If I had to pick a favorite moment from the show it would have to be our Under Saddle class for the Pre Adult division. I had been so concerned when five numbers were called to the middle of the ring almost right after the class began, including Teddy and Ellie. 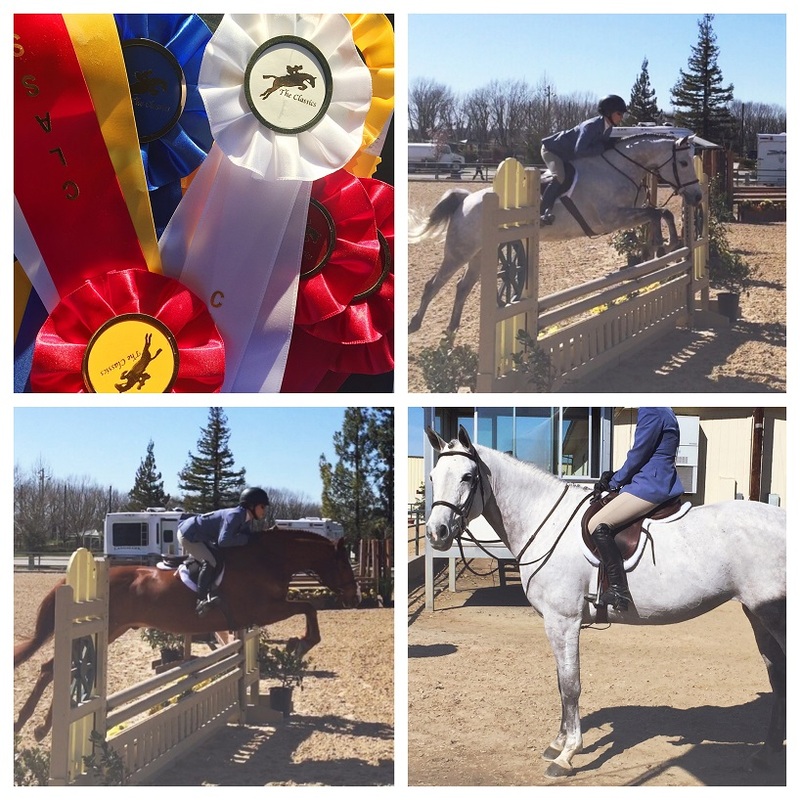 That exercise turned out to be in our favor as the top five ribbons went to those horses. 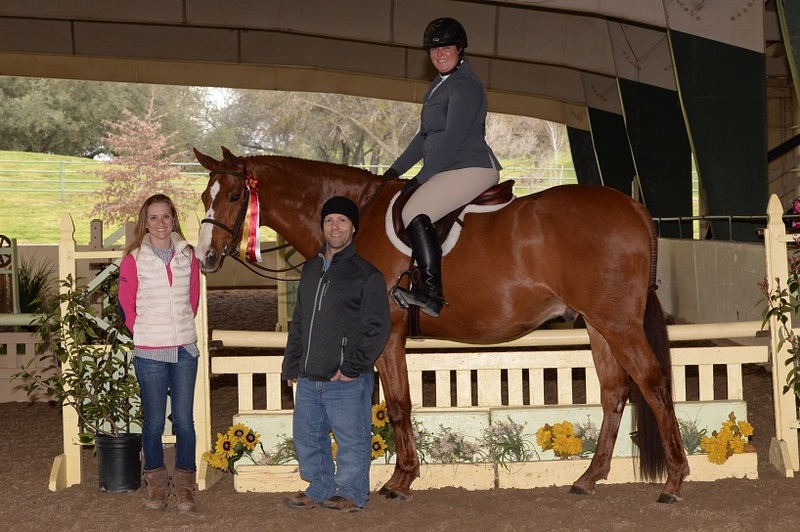 I was pleasantly surprised that Ellie was included in the lineup- there were a lot of very nice horses in a large division. I am just so proud of her. First Pre Green Show (3ft division), first Derby- she's game and keeps getting better and better! Excited for the rest of the season! Paul and I recently decided to reboot our lifestyle a bit prior to our trip to Japan coming up in April. The goal is weight loss: to lose a double digit number. Ever-practical-Paul is winning eye surgery if he meets his mark. He knows that I tend to be motivated by things that are funner (plus my vision is already pretty spot on) so he's offered up a horse show. Yes- a free horse show. Although I'm not entirely sure he realizes exactly how much they cost and I don't know if I want to divulge that information. 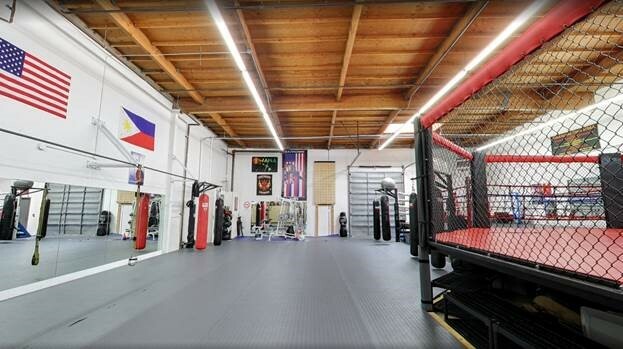 I joined an MMA gym, Dragons Den, down the street from my office to shake things up while still keeping a few drop in classes at the studio close to home. So I can gym anytime, anywhere. 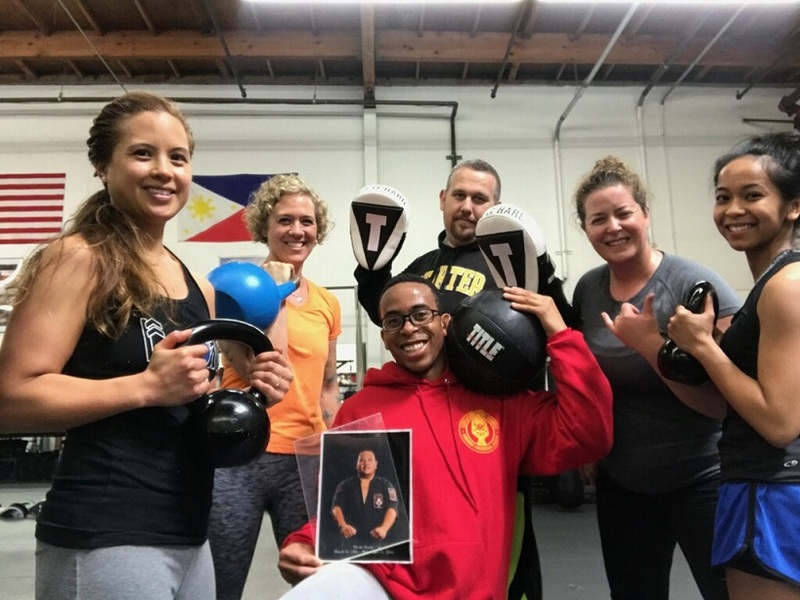 The new place offers a noon class + evenings which works perfectly for my schedule and gives traffic the chance to lighten up a bit for the drive home. Plus I get the chance to punch things during lunch- stress relief! 7 pounds down so far! Paul and I realized that we have not been on a vacation together since our long weekend in Monterey this time last year. 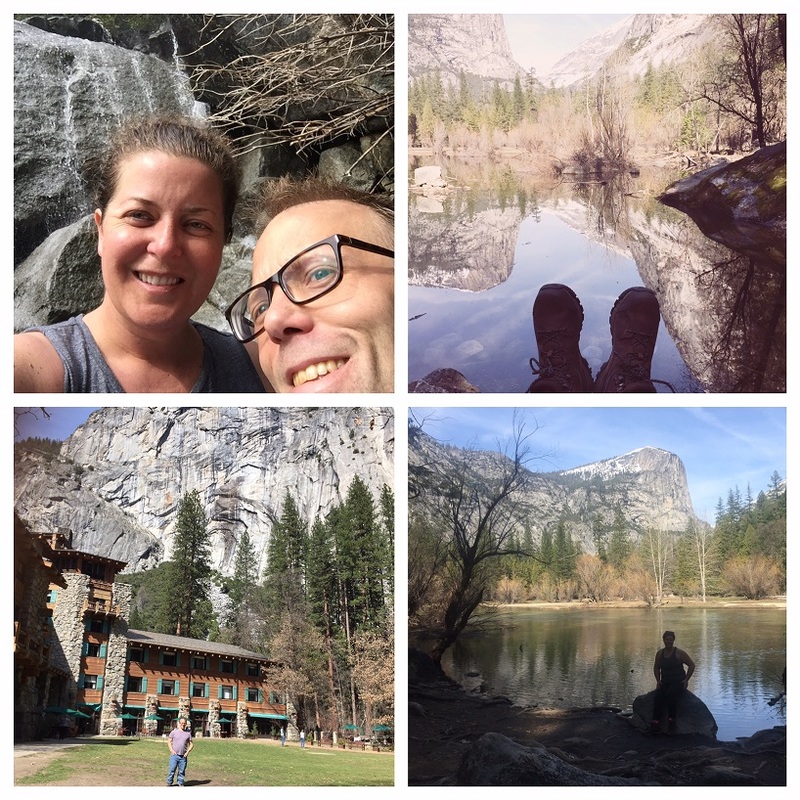 So his Christmas gift, a trip to Yosemite with a two night stay at The Majestic, came at the perfect time to get away. The weather couldn't have been better with sunny 65 degree days and dry trails. 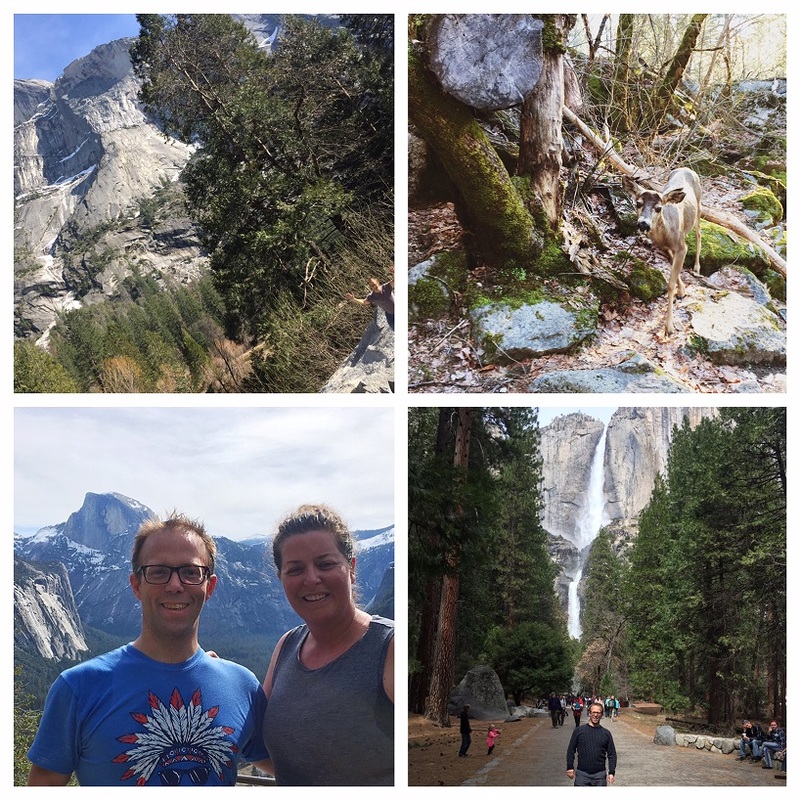 We explored the valley on some absolutely stunning hikes, read books, and ate delicious meals. I didn't realize how much I needed a moment and it was tempting to stay an extra few days! 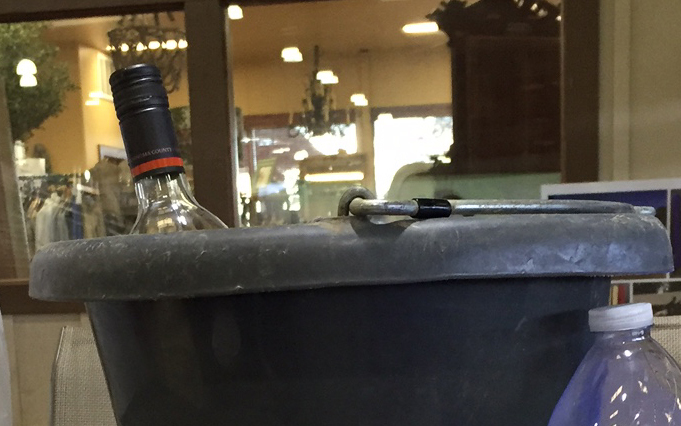 When a feed bucket becomes a wine chiller. Ellie is officially a Derby horse! 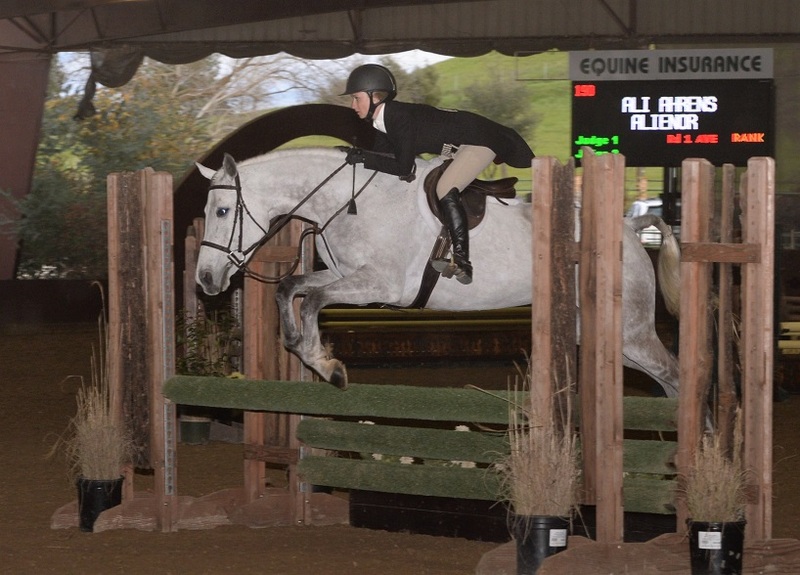 Northern Winter Classic ran a $10,000 Derby that offered 3 heights- 2'9"- 3'- 3'3" and Ellie competed at the lowest height. 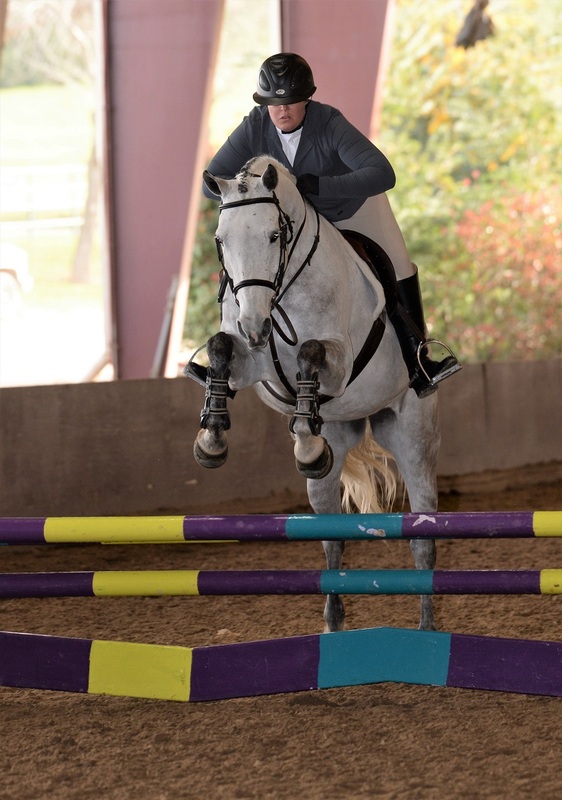 Even though she ROCKED her 3' Division earlier in the week, it was her first time at that height and had only done one 2'9" show late last year. RMEC has this notoriously realistic, big, scary log- and for as long as I've watched Derbies here, there are inevitably horses that just say, "nope!" The same was true for this show and we lost at least 10 horses to that log in a field of 40+. In most cases they turned to fence three, spotted the scary, and wouldn't go a step closer. 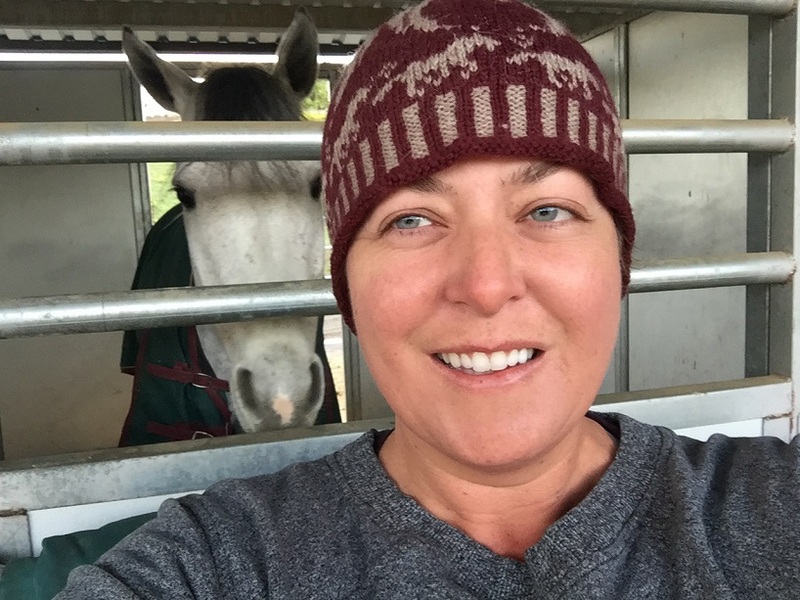 After watching the few horses before Ellie have some tough rounds I climbed to the top of the bleachers to film with a VERY large glass of wine. Not only did she truck around, she had some absolutely adorable jumps! A score of 66 was well deserved, Ali rode her deep to most of the fences to build her confidence and she was a little quick after a few- probably wondering what the hell she had just jumped and how quickly can she get away from it! My favorite part of the course was the two stride- she hesitated a touch through the middle but jumped out and got some airtime! And the lovely hand gallop down to the last oxer! Teddy jumped around in the 3' group and seemed entirely nonplussed by any of the fences! Unfortunately he had a few moments where he got a bit quick and scampered through a few lead changes. The spread between judges scores was significant- 74 and 80 for an average of 77. Pretty inline with what we saw earlier in the Open Division placings. The cutoff for Top 12 was 77.5 so he just missed the Handy by a hair! Really pleased with his round! One of the awesome things about the 4 week Northern Winter Classic Series is the prize money. Classes that offer a payout in a 2'6" division are VERY few and far between and at an A rated show, every little bit helps. Needless to say, with two horses attending, I had piled the pressure on myself for Saturday's $5,000 Classic. 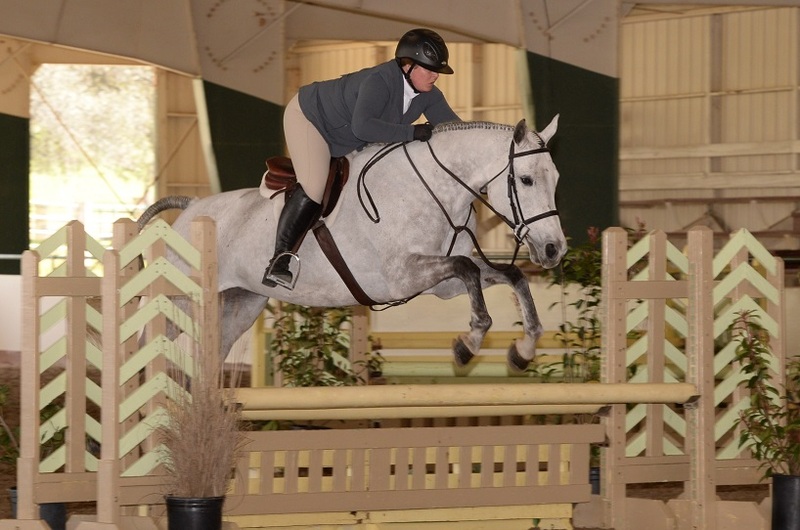 There were two O/F rounds- the first Hunter Round wrapped up the Pre Child/ Adult division and that score, combined with the second Round Classic score, determined placings for the Classic. Ellie went first and I liked her Hunter round quite a lot- I thought the score didn't necessarily reflect performance but there was also the addition of some new (and v nice) horses that joined the class who did not participate in the division. Hunters......and mare glare. I see in the video that we didn't stay as straight as I would have liked coming out of the judges line which would end up being our downfall in the second round. We biffed the first fence in a major way to start off our Classic round but had seemingly reorganized. The "Classic" component to this course was a bending line and after cutting the corner leaving the judges line, I didn't set my self up appropriately to get a nice ride into the first fence. Which also had a tiny little brick wall that pulled my eye right down to the base. Ells could have been a touch more forgiving for my lean here, but I looked down, she stopped, and I fell off like a slow sack of potatoes. Of course this all happened at the fence FURTHEST from the gate = longest walk of shame ever. I cleaned off my boots and climbed aboard Teddy- already worried about our lead changes and couldn't find the distance to a warm up fence to save my life. It was an exercise in compartmentalization to focus on the Teddy ride versus dwell on my tumble. The first round was fine- a little deep to a few fences but Teddy makes everything look pretty good. A score of 77 landed us fourth going into our second round. Horses had been riding the Classic bending line anywhere between a 6 and an 8. Thinking back to the ill-fated Christmas Derby debacle (where the line walked a 7 and I had committed to 7 and it was actually 8)- I decided to take the slightly more conservative 7 strides. When in doubt- add! Coming around to our last fence my only thought was, "for the love of God, Emily- don't mess this up." The course rode great for us for a score of 85 and second place. Some ups and downs (literally) but a second place in the Classic and Reserve Champion in our Division! Friday kicked off with an 8am Under Saddle. I rode Teddy and Marieka, our token junior, rode Ellie. The ring was super tight with 14 horses in the class and my heart sunk when the judge, after watching everyone trot for a few moments, pulled five of us into the center. Teddy and Ellie were both in that group. Teddy hadn't had much time to warm up, was a little stiff + managed to forge every single time we passed the judge. Everyone on the rail went through their paces and then a few more were called to the middle and the rest excused. Then we ALL went back out and did it all again. Teddy pinned second and Ellie pinned fifth- I guess hanging out in the middle was not a terrible place to be! To the Jumper ring for a quick .70 round to get our motor running. Or not. 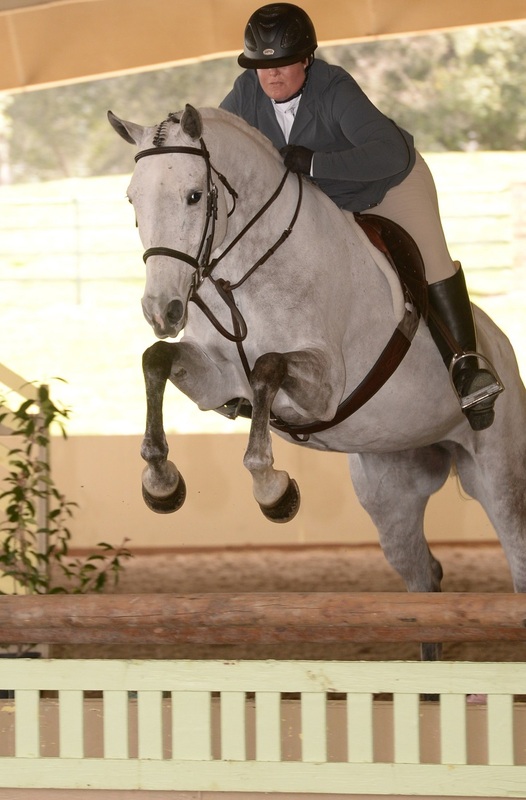 What course designer puts not one, but two, one stride combinations in a bitty jumper class? Are we heading to the Olympics here? No we are not. Ellie was game up until the combo and I didn't give her the confident ride she needed the first time.....or in our second attempt. Not a great confidence builder walking straight into Hunter 2. Our Warm Up Hunter round had a refusal- a spooky judges line that looked different from the others.....because sun happens sometimes. We got it in gear (complete with a lot of mare glare) for our first round but she fell out in the back coming around to that damn line again. 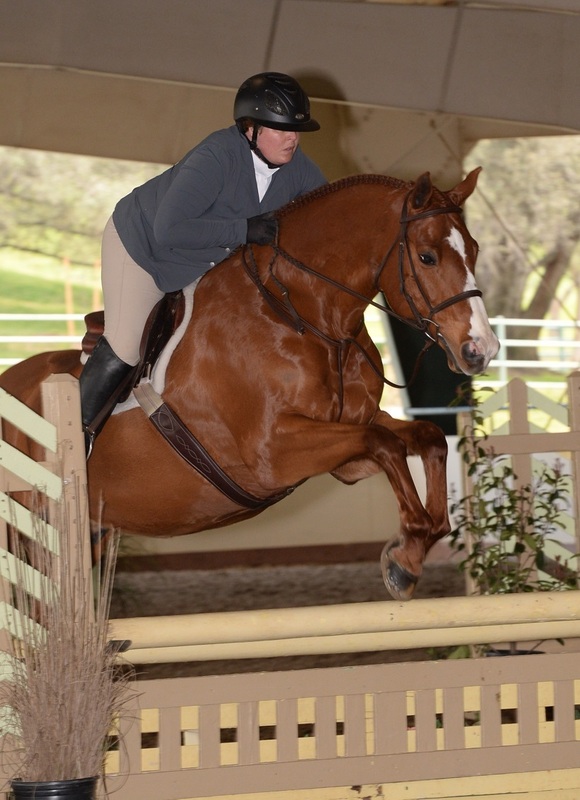 I loved our ride to the single oxer in this round! Round 2 netted us 5th which I was super please with given the number of horses in the class. Watching the videos gives a totally different perspective to the rides. 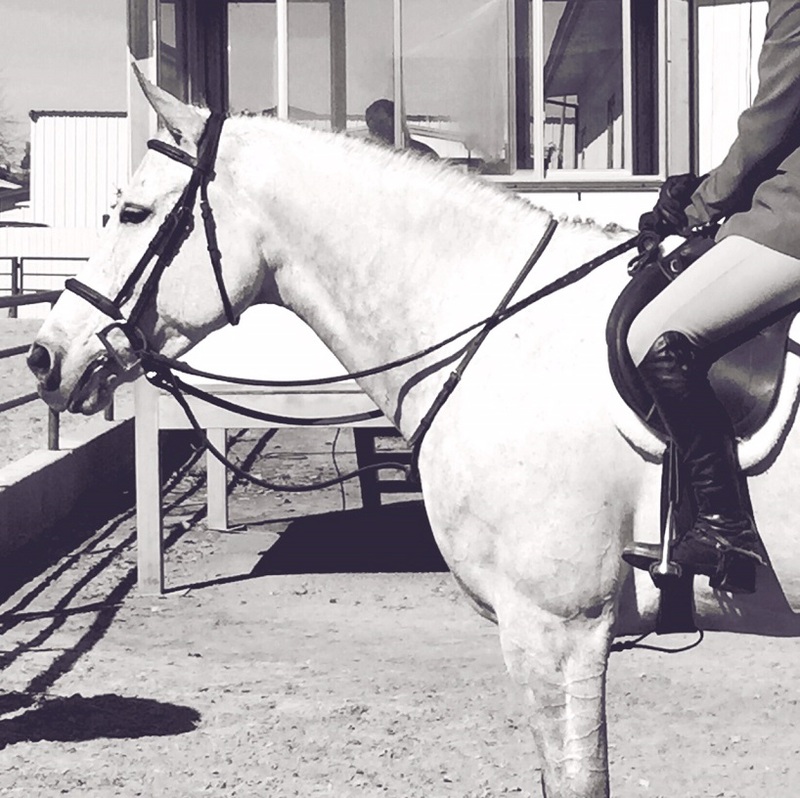 We FEEL like we're zooming around like bats out of hell, but what I see on the video is a slightly sticky mare (who doesn't look like she got her hocks done just a few weeks ago). We need to get to work at home on some of this 'tude- it just doesn't paint the prettiest picture. After riding the speed demon I was looking forward to my rounds on Tedster, despite never having actually jumped a full course or made it down any lines on him. Needless to say, our warm up (video below) was a bit bobbled, but still landed us fifth. Our first round Hunter course, which of course is not captured on video, was like butter. This guy reminds me of the DMV Sloths in Zootopia. He's like molasses but covers a ton of ground- plenty of time to wonder in a brief panic where my next fence was. We found the line- it is a Hunter course after all. I loved this round and I think it was a well deserved first place. I found out in our second Hunter Round that Teddy's favorite adult amateur stunt is to drop his shoulder and run through his lead change. So after a few of those scampers throughout the course we wrapped up the class with an 8th. The inconsistency was probably the most difficult part to manage throughout the show. And there was a lot of it- between horses, days, and trips. 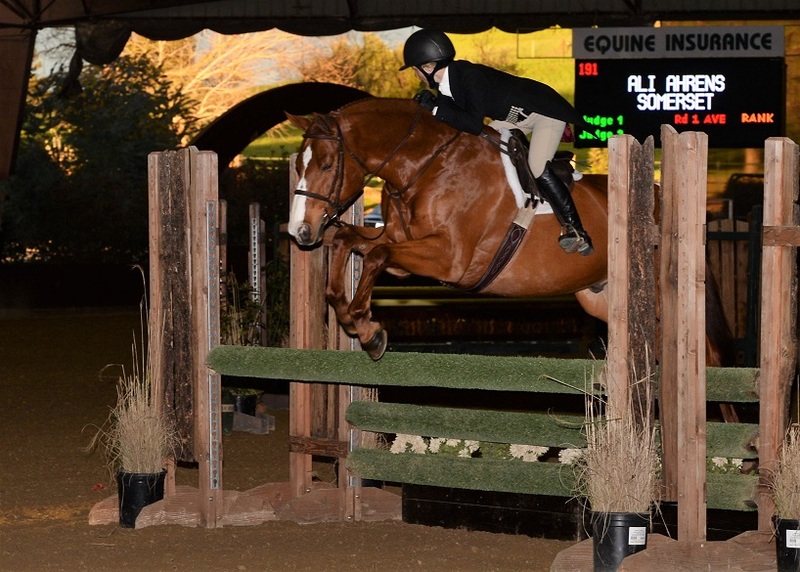 Saturday was our BIG day with a $5,000 2'6" Classic and Hunter Derby! The weather was absolutely gorgeous on Thursday and I hit the road to Sacramento bright and early to make sure I caught the 3ft Division. Unfortunately I missed Baby Vinnie make his show debut, but he ended up Reserve in his 2'3" division! So pleased for my barnmate and her new addition! Ellie went first in the Pre Greens- her very first time in 3ft. Didn't look over-faced, had no problem getting down the lines. 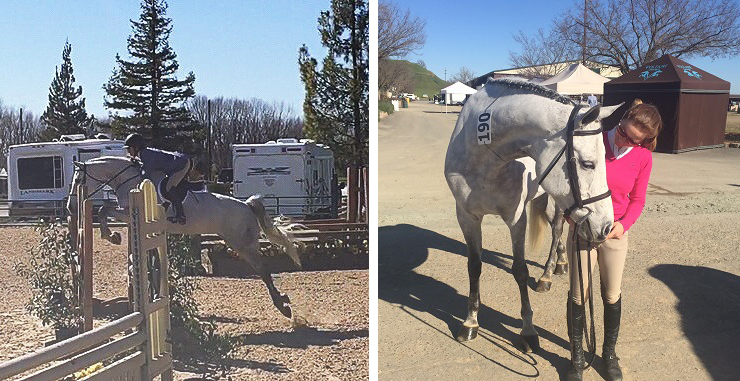 She ran a bit at the first fence in the first round, but settled down quickly and the second round got even better! She was in the jog for each of her pro rounds this week and ribboned in the middle of the pack. Super happy with her! Teddy had come into his first day with a first, second, and third. 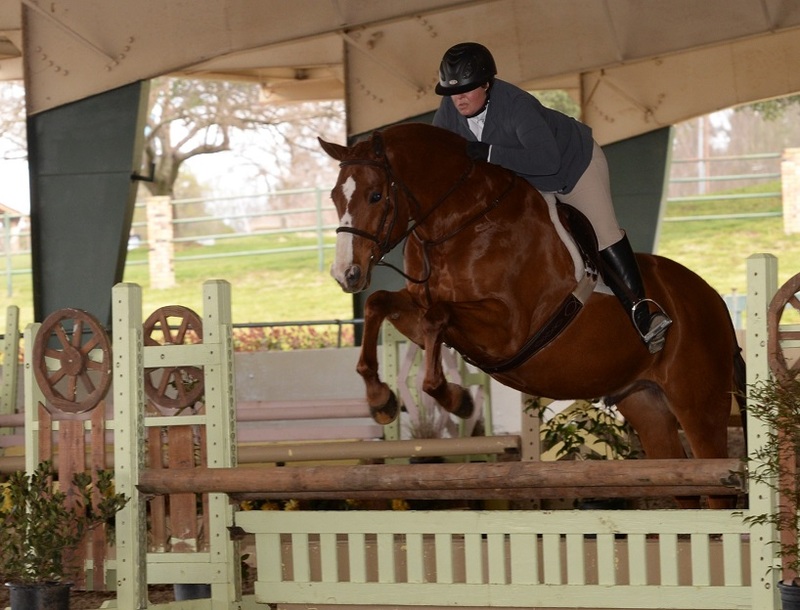 The judge on day two didn't love him as much and he had fourth in both round of his Open Hunter division. That's Hunters for you! Nonetheless he wrapped up Reserve Champion- what a lovely boy! A fun group dinner, Skinny Margs, and an early bedtime (at the cheapest and scariest Best Western of all time) to get ready for a FULL weekend of showing!